There’s this misconception that wearing the hijab is simply just…wearing the hijab. Not everyone thinks about the hardships or the dedication that we, hijabis, go through or have. And here, on this post, we’ll be discussing this and develop even more respect for women and girls who chose to use the hijab. For those sisters who want to know about the things you should know before deciding to wear the hijab, read here. Every woman who wears the hijab goes or went through hardships: emotionally, physically, socially, or even a combination of them all. Even if the environment was more accepting of the hijab, we still hesitate to make that decision. By deciding to use the hijab, we show to the whole world that we are muslim without having to be asked. That in itself is empowering and beautiful but can be hard to keep when faced with life. Because in reality, not everyone or everything in the world is good and that thought affects us especially when we first start using the hijab. Whether we want to admit it or not, sometimes the only barrier for muslim women from being dedicated to the hijab is, ourselves. We overthink, worry, and criticize. But that is a given and is normal. We worry about how we look or what other people might think of us when we wear our hijab. Sadly, especially during the first years, insecurity is a big enemy. Starting to use the hijab at an older age makes our brains more used to equating that “freedom” of showing our hair and skin to beauty. I am here to tell you that, that is not the case at all. You want to look more beautiful in your hijab? Then be confident while wearing it, be proud of it; you had all the courage to take that first step of dedication. When I first walked the school hallway at age 7, the only girl with a hijab in elementary school, I remember my heart racing like crazy. Kids looked at me and whispered to each other, some walked up to me and asked the most stupid questions ever but I kept my head up and went through my day like normal. Because I was still Conchita, I am Conchita. Now, I am fully aware that in the adult world it’s different: it can be more harsher. But being older has its advantages, we will be more able to control our emotions and how we handle any unwanted negativity. How little Conchita was able to stay strong is beyond what I can ever imagine. I don’t know how I did it. But there is one thing I remember doing: not letting any of the negativity within myself or outside affect me. I was confident and I think that’s why no one bothered me anymore. Because it became useless to. It was like moving a rock that has already been implanted onto the earth. 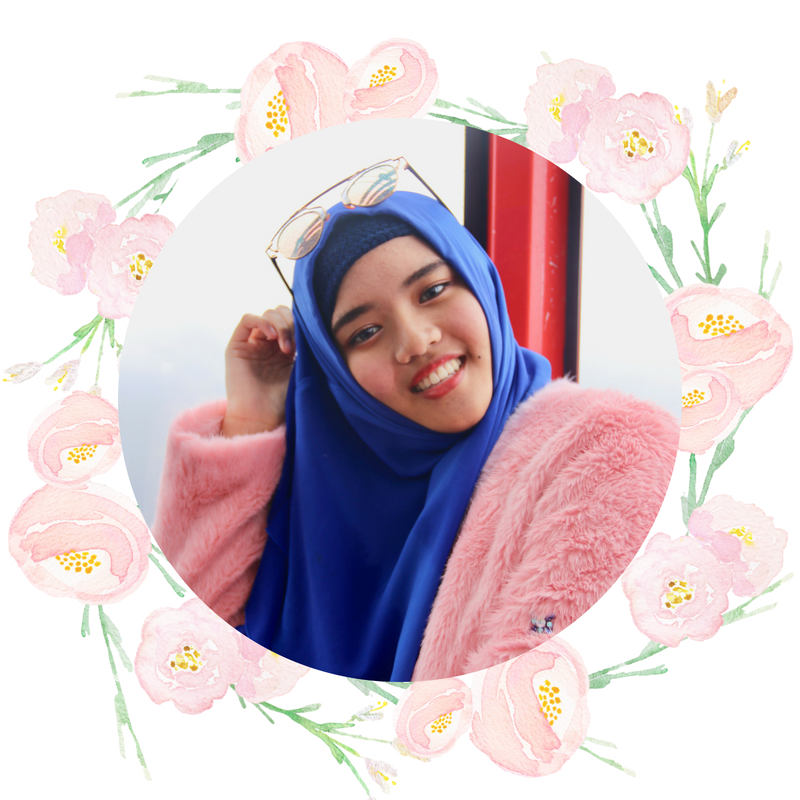 Thoughts about how I think I look while using the hijab stopped bothering me, I stopped thinking about what people might think is beautiful to them. What matters the most is that I, myself, feel comfortable and empowered. Most importantly, the only opinion that truly matters about whether my hijab is beautiful or acceptable, etc. is Allah. Physical hardships meaning the actual concept of physically using the hijab. “It’s hot. It’s too burdensome. There are too many rules. I don’t have all the clothing to cover myself. How can I go to this occasion with my hijab? I have to use this and that and that and this.” These are the thoughts we have when we first start wearing it. But believe me…when we finally fall in love with our hijab, not only that we get used to it, it will never bother bother us again. The other day, I was doing a 20 minute run in my physical education class and someone came up to me and asked, “Aren’t you hot in that?” To which I answered, rather boringly, “No.” Because honestly, even though the sun was shining right on my face that day, I did not feel the slightest heat. Although, my legs were burning but that’s because of the running itself. I’m pretty sure everyone gets burns when they run for a long time. we must find our own style and form of wearing it. Many people use scarfs that they personally wrap around but for me, after years of changing my style I have been loyal to the syari’ hijab. There are even easy-just-put-on-your-head hijabs or turbans. There is always something – some style- for everyone. We just have to pick the one that is the most comfortable for us. Where we just don’t want to spend too much time picking out our outfit. On those days, we can get frustrated about what we wear because There. Is. Just. Too. Much. To. Put. On. But we overcome it by simply finding a way to incorporate our comfy clothes into the outfit of that day. For me, it consists of a skirt, probably a random pajama top, some jacket or cardigan, and of course my hijab. Quick but stylish! I don’t know if this is just my personal experience or if any other hijabis have the same thoughts but, sometimes we can worry that we are being “too much”. What I mean is that we can overthink whether or not our outfit matches the occasion. Because with the added hijab, being a bit more stylish in how we dress is inevitable. Even the most casual outfits for hijabis can be seen as too fancy to others and even to ourselves. However, I no longer care about feeling that way because this is me and will always be me. If I am wearing “too much” to an occasion without having the intention to then, good for me! I might as well be the best dressed among the people there. Personally, I think that social hardships is the most involved out of all the hardships because once we are faced with some social issue, it can affect our emotional and physical health/thinking. I cannot say much about this particular issue because out there, so many women and girls are going through different things. Some more harsh, some more peaceful in the the way their society or community treats them as hijabi women. My heart goes to all of them. In foreign places, hijabi women walk through the streets with fear and worry because that’s just how the world makes us feel. We’re not scared or worried about the talks and whispers behind our backs rather, we’re scared that some event or someone might do us harm. We fear that the stares we get might turn into actions against us. We fear that the whispers behind us might turn into publicly asked phrases or questions that hurts us where we become vulnerable. Vulnerable to attention, to more attacks. We’re worried that if anything bad happens, no one will be there to stand for us; with us. That’s just one of the many, if not millions, of social hardships we go through. Imagine the many hijabi women who have had to go through some adversity in their life but who had all the dedication, strength, and courage to keep wearing the hijab because it is truly something they love and believe it. MashaAllah. Two very important things all hijabis have: dedication and strength. No matter what adversity life throws at us -painful memories, judgements, being hurt by someone- because of the hijab, we stayed. We kept it on. I think that’s why I have so much respect for hijabis who are so proud and confident of their hijab because they truly love the hijab. Yes, it is true that the hijab is for religion. But if every muslim women you’ve met didn’t have that love and belief in the hijab, not many of them would keep it. This is why the hijab cannot be forced onto people. Because who would keep it for their whole lifetime if they were being forced to? Think about it. Yes, I was 7 when I started to use the hijab but no, I was not forced to. My parents even told me that I didn’t have to wear it yet. Everyone was skeptical about that. People accused my parents for forcing me at such a young age but truthfully, honestly, all from the depth of my heart, it was my decision and mine only. How I kept it on for my whole life after that? I grew to love my hijab. I protected it at all costs. That’s the dedication part of this and now to the strength. In my life, I know a few friends who decided to give up on their hijab because of their environment. This is not to shun them or anything, I know they might as well still be the most pious muslims with or without the hijab. But let me explain why wearing the hijab requires strength. I think hijabis’ strength can be categorized in two different situations: strength in hard situations and strength in more environmental/societal issues. Having strength in hard situations like encountering bad people who judge, offend, or attack us because of our hijab etc. is so important. Because I know there are many hijabis who are faced with these situations and sadly, it can affect them deeply. It’s a fight or flight situation. We have to decide whether we want to fight for our hijab and beliefs or just runaway from it. Which can end up in us giving up on our hijab. Taking it off, hoping that those people won’t bother us anymore. This is where the strength kicks in. Those who have gone through rough times had the strength to stand up, put on their hijab and keep walking. Inside, they may be afraid that the same bad thing could happen again but they have so much faith in there hijab, they kept it no matter what might happen. If that’s not strength, then I don’t know what is. One of the friends I mentioned moved to America for college but as soon as she arrived, she decided to take off her hijab. Not because she wanted to but, because she was afraid. She was afraid that expressing her religion so openly might make her into someone vulnerable in America’s society. She decided to runaway from the problem rather than fight it. We, as muslim women, don’t want to have such views about people but the reality is the reality. And sometimes it scares the best of us, making us feel like running away is the only way to stay safe. having strength despite environmental/societal norms is also just as important. This is one of the big reasons many women, today, are hesitant to wear the hijab. I have already discussed this in the social hardships section. We are so used to thinking that being “free” -letting our hair down and showing some skin- is beauty. Some even think that that’s the best way to express themselves. My friend fell into that trap. She wore the hijab for a few years but suddenly in high school, she secretly kept opening her scarf whenever she wasn’t with her parents. Eventually, she was found out and permenately took off her hijab. I don’t despise her for doing that. She just wasn’t strong enough. Even if she tried to stay strong, her thoughts and worries about “fitting in” overtook her. This is why strength in these situations is needed. We have to grow to understand that we don’t need to fit in by going against our hijab. We have to have the strength to tell ourselves that our beauty does not depend on what we wear or how we dress. And if our friend group is not influencing us in positive ways, it’s better to find new ones then to stay. To end this post, all I have to say is that hijabis have so much confidence. Confidence becomes a part of us when we fall in love with our hijab. It’s already hard to fit in society and not having confidence gets us nowhere. By showing and being proud of our hijab, it sends a message to people that we cannot be messed with regarding our faith and hijab. Confidence shines through us as we walk those streets and hallways. Yes, we are muslim women and we are confident, beautiful, and will protect our hijab. And these, these are the things that make me so proud of not only myself but other hijabi women. Despite the painful stories that we don’t share, despite the judgements we face, despite our own self-insecurities, we fought through. We stayed. If that hijab is still on your head after all these days, months, years…good job, I want to say you did well. No. You didn’t do well. You did exceptionally, amazingly, extraordinarily well. In my eyes you are one of the most strong, dedicated, confident, women walking on earth today. But that doesn’t mean anything, right? You know what does? Allah, God, himself, probably -even clearly 100%- thinks the same way. And what other compliment would you need after that? This is a beautiful post. I love how it covers all questions that a non-hijabi might have but never know whom to ask. Cheers to you, girl! Always wear your empowerment !! This is a very interesting article it’s made me think of it from a different point of view I am definitely sharing this with my friends. I have huge respect for hijab women. In my country we call them ‘covered’ girls. It’s highy unsafe here, so I don’t do that even though I want to. Respect is well earned by all of them! Thank you so much for having respect for them there. It means a lot to all of us. Thank you Conchita, I never realized how difficult it must be to wear a hijabi and the kind of awfulness you beautiful ladies have to deal with. I wish people were more forgiving and start realizing that being different isn’t a bad thing. Rather it’s something that should be celebrated and encouraged. Thank you so much for taking the time to read and understand more about the hijab and the ones who use it. I agree that we need to change our mindsets. Because no one should be harmed in any way just because of what they wear. Such a deep and beautiful post, the hijabi is not something I know a lot about but I love the message you are sending to woman who proudly wear their jihabi and all the other woman in the world, you are right, all women should be proud and confident in who they are and I am sure this post will help to reassure many who have found themself in the struggle you’ve faced in the past. Thank you so much for taking the time to read. I hope that this post will really empower those using the hijab and even those who don’t. Because you’re right, every woman has the right to be confident in anything they wear or do. I can imagine that is very hard to take the decision of wearing a hijab especially in today’s western society when people don’t really understand what muslim means due to the recent things that happened in the world. I have traveled to muslim countries in the past and I got used to the hijab, so when I moved to England I wasn’t surprised to see so many women wearing them. But for a child, I can imagine how hard it must be. Indeed it takes a lot of courage and confidence. I am so grateful to you that you have developed a better image of muslim women and muslims in general. Because of the harsh things media has said about us, we always worry about fitting in and trying to look like we won’t cause any harm. It’s time to change that especially for children growing up. Because it can be hurtful for their futures if they are constantly being told that they might be hurt just because of their beliefs or what they are wearing. I am glad you shared this! My mother just started wearing hijabi and she doesn’t feel confident with it on sometimes. I am definitely going to share this post with my mom. I hope your mom gains confidence through her journey because she has all the right and potential to. Thank you so much. Very interesting read, a close friend of mine has only just starting wearing her hijab again. I will share this with her for sure. What a well written post. Thank you for sharing your thoughts on this, I have also seen many women that do a great job at styling themselves up and look great with it on. This was such a beautiful article that provided great insight to the beauty of Hijabi women! Because of this I have a deeper understanding of what life is like for them and it has gained much of my respect. Thank you for sharing such amazing work! Loved reading. Thank you so much! And I am so glad that you got to learn more about hijabi women, I can say, as one of them, that we are so grateful. Thank you so much. Yes, it can be hard to adjust to new environments, I hope this post can benefit them! A women who can stand up for her beliefs is stunning. I don’t know much about the hijabi, I don’t know and I don’t pretend to know, so when My children asked my why a women was wearing it I simply answered that it’s her belief. This post though will allow me to answer with a more thought comment when I’m asked it again. It’s great that you can now have a better and more understanding perspective about hijabi women. We appreciate it so much. Your kids will be able to grow up with a more open-mind about this topic. Thank you for sharing this and for giving us perspective on what it’s like to wear a hijab. Your confidence and advice will help so many other women! You are right, hijabi girls and women are dedicated and strong. This was a great post, so inspiring. Thank you for sharing your views and it is just lovely to read how confident you feel. This is very enlightening, I will admit that I am one of those people who never really saw wearing Hijabs as anything but just that; wearing them. Thank you for sharing, it is always good to get insight on other cultures, religious practices, traditional practices e.t.c Understanding better makes us respect the, even more. I didn’t know as much but it is good to be able to relate even in the smallest way to the people I see everyday. Thanks for sharing your mores. This is such a great post! I don’t know much about the hijab so this was a very insightful post! What an interesting and inspirational post to read. I’ve tried to wear Hijab and it looks so good to me. Your advice will help other women. Glad you shared your own thought about it. By the way, you look gorgeous in your Hijab. I had no idea you ladies could face so many challenges wearing hijabi. I have lived in a Muslim country and wish I had read your post before. You are very inspiring, thank you, Conchita! It was interesting to read your point of view. Different perspectives and people make this world. We should be accepting of them all. Beautiful post! I didn’t know much about hijabs. You answered most of the questions I had. Enjoyed reading your perspective. This is an interesting post. I love how it covers all questions that a non-hijabi might have, thank you for sharing the information and the perspective. I don’t know them that much but the way you describe them makes me feel that they worth the respect. And to me, and of course, to everyone, women, as well as men in all raise, should earn respect from each other. You really made me see this scenario from a different point of view. You are certainly very confident and strong. Thank you so much for writing this post. People need to hear this! Thank you for sharing this, there is so much stigma attached to the hijab! You’re confidence and beauty shine! This is a beautifully written, inspirational post. Thank you for raising awareness and for answering the questions so many would ask. Huge respect! This is so interesting and beautifully written. Thanks so much for sharing this with us, I also have a lot of respect for those that wear hijabs.